Will the EU Emissions Trading System (ETS) experience a smooth ride or organised chaos? Following the Brexit pathway, the UK will no longer be part of the European Union from April 2019. As of today, the UK government has made no official announcement on the future participation of UK installations within the European carbon market. 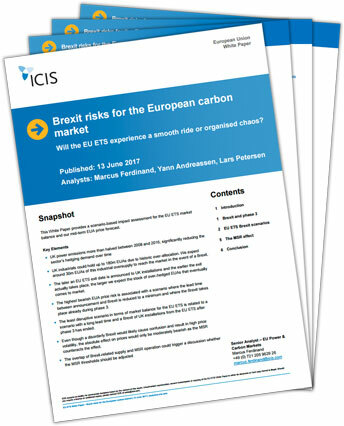 This White Paper, provides a scenario-based assessment analysing the impact of Britain’s exit on the EU ETS market balance and as well as our mid-term outlook for EU Allowance (EUA) prices. We found that the most bearish EUA price risk is associated with a scenario where the lead time between the announcement of Brexit and the actual end of compliance obligations for UK installations is reduced to a minimum, and when Brexit takes place before the end of phase three in 2020.